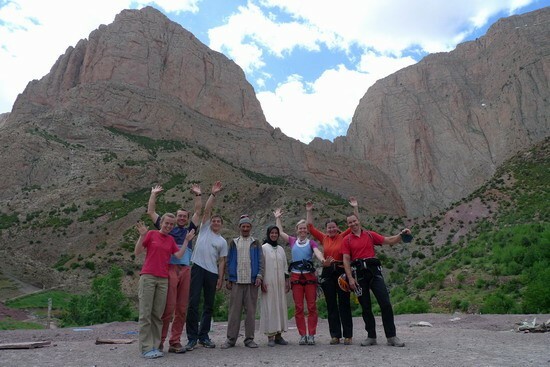 In end of April ’09 our six-person team (Milena, Alenka, Miha, Luka, Andrej, Tanja) accompanied by the Moroccan climber Jonathan traveled to the small village of Taghia, which lies in the middle of incredible canyon landscape in the heart of the High Atlas. The snowy peaks, green river valleys, very traditional life of locals, their vast houses of stone and mud and transportation with mules and donkeys – made us feeling like we are somewhere in the middle of the Himalayas, not in Africa. Already the first afternoon we run to the nearest wall, and in the next two weeks we gather meter after a meter, route after a route. Peaks above the village rise over 3000m. The area has a more than 10, up to 800m high walls, and currently has more than 100 routes of all difficulties. We have climbed bunch of excellent routes, harder and easier ones, and did also one spectacular first ascent. Climbing in featured and sometimes incredibly sharp limestone was indeed a real pleasure. At the end of our expedition Tanja and I (Andrej) treated ourselves with a bit of “our” exploration of Morocco. In 12 hours march we crossed the main ridge of Atlas, and so arrived at its Sahara side. Then we traveled by bus to a “real” sandy Sahara, and back in the Middle Atlas to enjoy biking in the beautiful forests of Atlas cedars, than to royal Fez, capital Rabat and to wild Atlantic surfing coast for the end! Another PERFECT expedition!